Lamb House is an 18th-century house situated in the ownership of the National Trust. The house is run as a writer's house museum. It was the home of Henry James, and later of E.F. Benson. The author, Henry James, claimed that whilst he lived here he witnessed "poltergeist activity" and the apparition of an old woman wearing a mantilla. She even helped him with his literary works. Benson also reported the poltergeist activity as did another author, Rumer Godden. For further information, please read Haunted Britain and Ireland by Richard Jones and Britain's Haunted Heritage by J.A. Brooks. 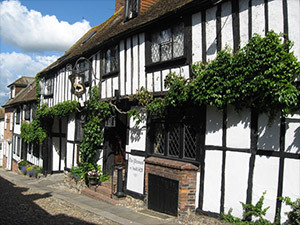 The Mermaid Inn is steeped in history, with its cellars dating from 1156 and the building rebuilt in 1420. It is also reputedlt haunted. In the early part of the 20th century, the proprietor of the inn reported witnessing a ghostly duel between two men, one of which was killed by being run through with a rapier before being disposed of beneath the floorboards. Pictured left is the Mermaid Inn courtesy of Richard Rogerson. Near the chapel of Austin Friars on Conduit Hill, apparitions of monks have been reported. For further information, please read Britain's Haunted Heritage by J.A. Brooks and Haunted Britain by Antony D. Hippisley Coxe. The gobbling of phantom turkeys was reported here around Christmas, but according to Brooks the sounds seem to have dissipated over time. Rye is a small town in East Sussex, England. It lies 2 miles from the open sea and is at the confluence of three rivers: the Rother, the Tillingham and the Brede. Pictured left is Lamb House courtesy of Oast House Archives. Licensed under CC BY-SA 3.0 via Wikimedia Commons.